Jerry Seinfeld loves cars. He also loves comedians and coffee, which most people know by now. But none of these is Seinfeld's favorite thing in the world. No, the legendary comic's favorite thing in the entire universe is energy, and the best way to acquire more of it (he claims) is through Transcendental Meditation. Seinfeld raved about TM on the SiriusXM radio show "Success Without Stress," calling energy "the thing that I love more than money, more than love, more than just about anything... I think this is the reason, by the way, that I am so enthusiastic about TM." He's far from alone. "It's a game changer," Katy Perry beamed about TM in the April 2017 cover story of Vogue, explaining that it makes her feel illuminated by "a halo of lights." "I come from a line of neurotic Jewish women who need Transcendental Meditation more than anyone," Lena Dunham told a crowd at the David Lynch Foundation, a nonprofit that provides scholarships and pro-bono TM instruction to underserved populations. Other celebrity advocates include Hugh Jackman, Ellen DeGeneres, Cameron Diaz, Aziz Ansari, Gisele Bündchen, Lykke Li, Jennifer Aniston, Kate Hudson, Gwyneth Paltrow, Oprah, Sheryl Crow, Paul McCartney, Clint Eastwood, Mick Jagger, Heather Graham, and Moby -- to name just a few. In fact, the list of famous TM devotees could go on almost forever; it even includes Fox News and News Corp. CEO Rupert Murdoch, a firm non-hippie who probably doesn't even know about patchouli oil. Among all the stars who practice TM, director David Lynch (Blue Velvet, Twin Peaks) is the most prominent and active evangelist. He and friend Bob Roth (a TM instructor and practitioner) founded the David Lynch Foundation in 2005, for which Roth serves as Executive Director. In the 12 years since, TM has become almost as ubiquitous in Hollywood as drinking green juice after sweating it out in a boutique cycling class. But whenever a cadre of celebrities latches onto a spiritual movement and begins tossing around words like "energy" and "transcend," people want to know what the hell they're missing, whether or not this is some kind of cult, or if it's merely another example of the rich and famous existing on a higher plane. Alternative spiritual practices have long been a hallmark of celebrity culture, with past examples ranging from the Source Family, the health-food pioneers parodied in Woody Allen's Annie Hall; to the Children of God, the controversial cult in which actor Joaquin Phoenix was raised. Then there's Scientology, which recently ignited a firestorm of controversy thanks to the documentary exposé Going Clear. Transcendental Meditation, on the other hand, doesn't have too many critics. Billed as an "effortless" form of meditation that must be practiced for 20 minutes twice a day, the TM technique requires practitioners to sit with their eyes closed and silently repeat a personalized Sanskrit mantra (word or phrase) to themselves. The results are as varied as the people who practice it. Hip-hop mogul Russell Simmons says it's "almost like magic -- when you're awake, things become easier." Hedge fund manager Ray Dalio describes it as making him feel "like a ninja in a fight," while actress Eva Mendes says it "helps creatively on a level that I can’t describe... It’s tapping into something so deep that when I reap the rewards, I don’t even know I’m reaping them." Descriptions differ, but a consensus emerges among the advocates: Transcendental Meditation is freaking great. As a trademarked (™!) methodology, the teaching and initiation process of TM has been highly organized, standardized, and, yes, monetized -- the only way to learn the officially sanctioned version is from one-on-one instruction, taught by licensed TM teachers, who are uniquely able to teach the technique to new practitioners by assigning them a personalized mantra based on factors like their temperament and occupation. Like the well-chronicled practice of Scientology, Transcendental Meditation groups require adherents to shroud their spiritual journey in some level of secrecy. Followers of Scientology reveal past traumas to select members of the Church during the "auditing" process, which is intended to remain private; likewise, TM instructors ask that new practitioners not share their specialized mantra with anyone. A four-day course to learn TM will set you back between $900 and $1,000 ($960, according to Roth), though the promises to the dutiful lifelong practitioner are designed to render the cost minuscule by comparison. What price can you put on stress and anxiety reduction, more focus and clarity, and a healthier heart, not to mention the specific conditions it purports to alleviate, like PTSD, ADHD, and depression? "There's so much room for anxiety and fear. But transcending makes life more like a game -- a fantastic game." @RingoStarrMusic with #DavidLynch at @CapitolRecords. To help reign in his big 75th, @AXSTV be airing a very rare and exciting re-broadcast of #RingoStarr's #DavidLynchFoundation "Lifetime of #PeaceAndLove" concert tonight at 8 PT | 11 ET. Tune in and celebrate with us! Roth has a pragmatic response to why an effortless practice costs anything at all: "I believe teaching meditation should be a profession," he says. "The one-time $960 cost -- $480 for college students, $360 for high school students and younger -- is what helps the TM instructor have a salary. But if you don't have the money, we won't stop you." Roth clarifies that the price is a sliding scale, and that there are myriad grants and loans available for those that are unable to afford the standard price-tag. "More people learn to practice TM for free through the David Lynch Foundation than pay," Roth adds. "But when you pay, you're helping to pay the teacher and the rent of the center -- and you're also helping to pay for a kid or a veteran to learn how to meditate for free." That's the mission Roth returns to consistently: those who can afford instruction not only receive a lifetime of benefits, but they help provide those same benefits to schoolkids, veterans, inmates, and others who wouldn't be able to pay for the course on their own. And it's easy to see the broad appeal beyond those who struggle with PTSD or have other specific issues they'd like to address, especially when someone like Oprah describes TM as "a powerfully energizing yet calming experience. I didn’t want it to end. When it did, I walked away feeling fuller than when I’d come in. Full of hope, a sense of contentment, and deep joy." On the other side of the coin, though, comes suspicion, especially in light of stories from former Scientologists like Leah Remini and Paul Haggis, who accuse the Church of Scientology of aggressively soliciting funds from its members and inventing excuses to charge more for reaching supposedly higher planes of spiritual enlightenment. In both cases, rigorous standardization and tight-knit community engenders purity and precision, but also a sense of intrigue and elitism, both of which are ageless -- even defining -- aspects of celebrity culture. In that sense, it's easy to see why TM has taken Hollywood by storm. Katie Couric, was the perfect host for an amazing night of laughter and song at the Kennedy Center on June 5 in Washington, D.C. Thank you, Katie! You are the best! As for how it all happened in a relatively short period of time, Roth concedes that Lynch has driven TM's spread among the elite creative cohort. "People in his field -- a Martin Scorsese, or a Naomi Watts -- would go to him and say, ‘What's this meditation thing?' and he would say, 'Bobby' -- people call me Bobby -- 'Would you teach Martin?'" 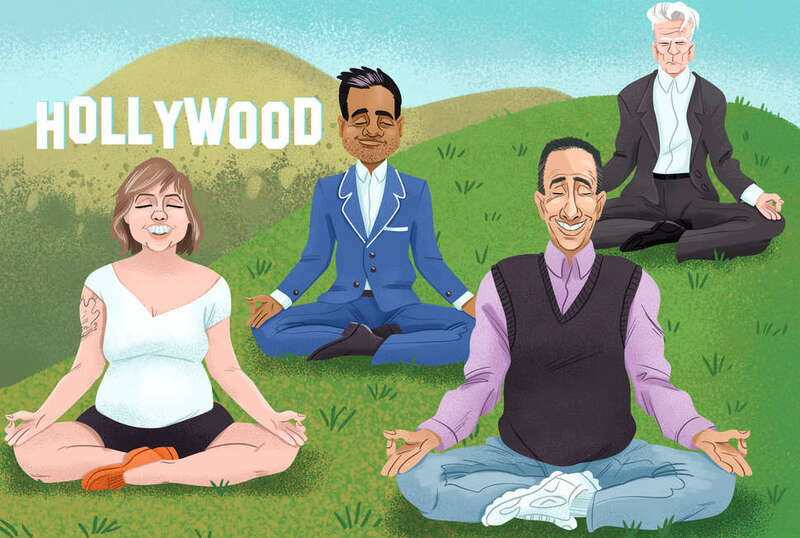 Long before Lynch ignited a word-of-mouth trend, Transcendental Meditation had roots planted firmly in pop culture. Maharishi Mahesh Yogi founded TM after beginning his ascent to guru-hood after spearheading the "Spiritual Regeneration Movement" in India in 1958. 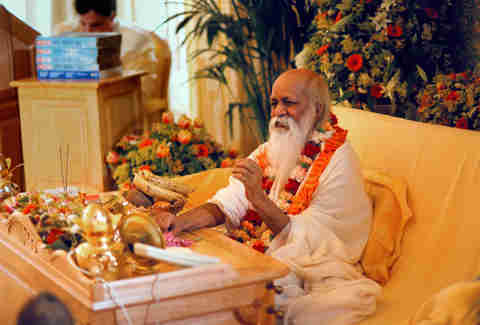 The following year, Maharishi himself brought the newly minted technique of Transcendental Meditation to the US, picking up steam in the '60s, during the glory days of alfalfa sprouts and Esalen, the latter of which was portrayed in the final episode of Mad Men. As cultural winds shifted and a new generation became interested in free thought, free love, and expanded consciousness, TM began attracting celebrity acolytes, most notably members of The Beatles and The Beach Boys. Today's George Harrison is Lynch, who hasn't made a film since 2006's Inland Empire, and whose legendary TV show, Twin Peaks, only recently returned after a 25-year hiatus. It's clear that Lynch has spent the last decade primarily focused on his TM practice, supporting advocacy initiatives for TM education at the David Lynch Foundation, and spreading the gospel of TM to Hollywood and beyond. "It was important for me to say something to the people... about my personal experience," Lynch told The New York Times, reflecting on studying TM under the tutelage of Maharishi himself in 2002. Though Lynch has been meditating for more than 40 years, it was only after practicing TM with its founder -- spending an eye-popping $1 million to do so -- that Lynch began his journey as a missionary for the cause. Never mind that Maharishi didn't even make a physical appearance, merely communicating with Lynch via dial-in from his room. Apparently, it was one hell of a teleconference because it convinced the director that he needed to evangelize on behalf of Transcendental Meditation, eventually culminating in the formation of the David Lynch Foundation. "Lynch doesn't even want to make films anymore," director Abel Ferrara asserted in an interview with Indiewire back in 2011. "I'm a lunatic," Ferrara added, "And [Lynch is] pushing Transcendental Meditation." It's that $1 million price tag to study with an absentee guru that gives cause for suspicion of this supposedly rigorous spiritual practice. And with celebrities now at the helm of TM's revival, it's no wonder that people have begun to wonder about its "cultic dimension." At what point does belonging to a costly spiritual community cross the line separating benign practice and coercive sect? The very conceit of meditation is democratic, that anyone and everyone can benefit from its practice without a cost-based barrier to entry. So perhaps the draw of TM for celebrities is that it offers a sense of exclusivity: why wouldn't famous multi-millionaires spend a relative drop in the bucket to be a part of a spiritual cool kids' club? And the air of secrecy surrounding the mantra may offer a small sense of privacy to people who normally get very little of it, even though that secrecy could create the impression that TM is a relatively benign kind of cult. Carole Cusack, Professor of Religious Studies at the University of Sydney in Australia, cautions that "cult" is an amorphous word used by the public to sensationalize stories about fringe spiritual practices, and not by scholars studying new religions and spirituality, "[The word cult] belongs to the world of tabloid journalism and sensationalist revelations about abuses in communities, etc.," she says, explaining why it so often appears in stories about Scientology. "A cult is a religion or a spirituality that you don't like," she adds. "All the things that people criticize about Religion A happen in other religions; it's just that Religion A gets stigmatized." Critics have called Maharishi "a fraud." Transcendental Meditation isn't a religion per se, so it can more easily avoid accusations of cultishness. But for Cusack, it's difficult to distinguish a practice from the religious tradition that spawned it: "TM is mostly taught as a technique... I think that it's a bit simplistic to imagine that you can completely sever a practice that is meant to be religious from its religious context." In other words, even if TM is for everyone, can it truly slough off its roots in Hindu religious practice? And if it's inherently religious, doesn't it open the door for accusations of cult-like practices? After all, it was founded and spread by a self-styled guru who charged David Lynch $1 million for a teleconference, and who by some accounts promised followers they could learn how to fly. Since Maharishi's death in 2008, more and more critics have sought to interrogate the roots of TM, calling Maharishi a "controversial figure" and even "a fraud," pointing to John Lennon's eventual opinion of his former spiritual teacher. In 1986, former TM practitioner Robert Kropinski went so far as to sue the Maharishi University in Fairfield, Iowa for $9 million over allegations of fraud, neglect, and emotional damage (a jury gave him $138,000). Today, Maharishi remains positioned as the iconic pioneer of the TM community, responsible for the organization's growth into a multi-billion-dollar empire -- while the David Lynch Foundation operates as a nonprofit, spreading any message (religious or otherwise) to the masses costs time and money, which means the DLF must raise funds. And soliciting money, no matter the cause, always has the potential to veer into coercive territory. Roth wasn't shaken by the critiques of TM, which he addressed one by one: its price tag, its apparent secrecy, its elite celebrity cachet, its seemingly inexplicable trademark, even whether it could be considered a cult or passing celebrity craze. "It's not a craze," he says. "We teach 10,000 kids and nobody knows about it. But when we teach 20 Hollywood actors, the whole world knows about it and thinks everybody in Hollywood is doing it. In fact, tons more kids... are learning it." Cynthia Ann Humes, Associate Professor of Religious Studies at Claremont McKenna College and an expert on Hindu practices and gurus in America, also points out that there's far more mainstream, casual acceptance of meditation than many people realize. "You have so many doctors completely on board with teaching patients meditation so that they can overcome [health] problems. Meditation is not fringe anymore. It is an accepted form of behavior that can produce multiple goods." It shouldn't be a surprise that the kids receiving TM education, or patients with heart conditions learning meditation, aren't splashed on the covers of In Touch or Us Weekly. But Roth also doesn't deny that celebrity endorsements help the current goals of the David Lynch Foundation: "To raise sufficient funds to do large enough independent research studies on TM... and to make it available to anyone and everyone who would like to learn," in his own words. "The wealthy people I teach are the ones who… are funding all these programs for the kids anyway," he explained. "Remember, the $960 pays for a lifetime of instruction… and helps a child or veteran learn for free." Are you transcending with a small t, or Transcending, capital T? So when Hugh Jackman says, "In meditation, I can let go of everything. I’m not Hugh Jackman. I’m not a dad. I’m not a husband. I’m just dipping into that powerful source that creates everything. I take a little bath in it," he is also, by Roth's formulation, performing a transitive act of charity because he supports TM and the work of the David Lynch Foundation. While Humes points out that many of the medical and psychological benefits of meditation don't necessarily specify that you have to practice a trademarked version to drop your blood pressure or reduce anxiety, there are also studies suggesting TM in particular offers benefits: the official TM website boasts 380 peer-reviewed research studies in more than 160 scientific journals. This enumeration closely mirrors the list of proven benefits of other, untrademarked meditation methodologies, from mindfulness to loving-kindness to Vedic meditation (a mantra-based technique that is said to be nearly identical to TM, minus the $960 price tag). "There's too much siloing," Roth laments, speaking of people's tendency to over-categorize the array of meditation techniques out there. "They're different tools. And I think people should be given access to as many tools that are scientifically validated to work." In explaining TM's particular methodology, Roth makes a sensible defense for the TM trademark: it's a matter of "quality control." Given that meditation has been rendered so much a part of capitalism that people casually market themselves as mindfulness "coaches," there's an even greater need for standardization. "Mindfulness is so diffuse that anybody can say anything," Roth said. "And from a scientific standpoint, that's very dangerous." More simply: Are you transcending with a small t, or Transcending, capital T? For instructors of TM, it makes all the difference, and keeping the mantra a secret is a part of standardizing TM instruction, according to Roth. "Keeping [the mantra] private is actually to avoid confusion. When you learn, I give you a sound, a mantra, and it's yours. These mantras are over 5,000 years old. I don't have 7 billion different mantras, someone else could have your mantra," he says. "But the way you think it, the way it fits you, fits your person, whatever it is, is going to end up being different than somebody else. And so we ask someone, when they learn, just keep it to themselves." One thing is for sure: Celebrity support for TM has raised cultural awareness of meditation's benefits, which isn't just an inherent good, but potentially a cheap tool to help combat many of the chronic physical and psychological illnesses that currently require expensive, drug-based treatments to remedy. If saying, "I meditate" is no longer synonymous with dwelling in an incense-filled commune, subsisting on unhulled flax meal from the bulk aisle, then more people can reap its benefits. Companies like Google, Amazon, Goldman Sachs and Deutsche Bank offer meditation classes to their employees for reduced stress and boosted productivity. From celebrity culture to professional life, meditation has become cool, normal, mainstream. Whether or not its popularity will peter out in Hollywood remains a question. Will TM disappear from tabloid pages if and when David Lynch tires of holding its banner? For Roth, it's an irrelevant question; only results matter. "Our whole focus is research now," he says. "If the VA pays for veterans to have Xanax, Ambien, or Klonopin, why can't they also pay for a veteran to learn TM or mindfulness or something else if there's research to show that it works?" Roth is quick to qualify that he has "nothing against the pharmaceutical industry," but his comparison demonstrates a compelling point. We don't dismiss pharmaceutical companies as unethical for promoting pills that have pages of adverse side effects, but we shudder when hearing that a branch of meditation cares about quality control, research, and compensation for its instructors. Author, supermodel and wellness advocate @mirandakerr starts her days off with #TranscendentalMeditation. Another thing Transcendental Meditation has in its corner is that it doesn't ask all that much of anyone who wants to practice it. "With TM, people don’t have to agree to accepting the whole shebang -- Hinduism for example," Humes notes. "Scientology requires you to accept everything. TM isn’t a religion in that sense. It’s not even a fringe religion. It doesn’t require you to change any belief patterns. The only thing you need to believe is that you need to practice meditation." Despite Cusack's skepticism of the distance from religion a technique based on religion can achieve, Hollywood has yet to convert to Hinduism en masse. Unlike the bannermen of Scientology, Jerry Seinfeld will probably not be replacing his annual physical with spiritual devotion -- and we similarly don’t have to worry about Katy Perry and Lena Dunham raving about Thetans. Tom Cruise, on the other hand, will likely continue to use the Church of Scientology as a reason to regard chemical depression as bunk. Regardless of whether you think meditation is hokey, or Transcendental Meditation is an excuse to charge people more for something that should be free, it's somewhat reassuring to know that teachers and practitioners of TM take its name seriously. As Roth puts it, most of us would be pretty horrified to meet someone who said "I'm a cardiologist" who turned out not to be a cardiologist: "It shouldn't be like a horrible odyssey to find out the phone number of somebody who's a properly certified meditation teacher." If you seek out meditation, you shouldn't have to risk shelling out money to a genuine huckster with no training whatsoever. As for whether Transcendental Meditation compares with Scientology as a coercive spiritual practice, Humes offers a telling anecdote. "I used to invite Scientology people into my class on cults. I stopped bringing them into the classroom because it was so complicated. The students were almost frightened by the people sent to represent Scientology. It’s not the same."